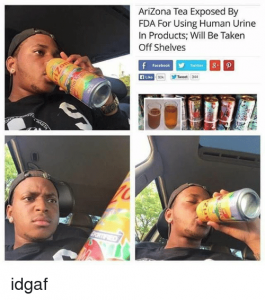 Truth Or Fake - Does AriZona Iced Tea Contain Human Urine? A story about Arizona tea urine has been spreading like wildfire on various internet forums and social networks. Rumor has it, the FDA (Food and Drug Administration) has found human urine in the product. Supposedly, it’s an active ingredient. The story goes that the FDA discovered copious amounts of stored urine at the factories’ premises. The fake news piece goes on to claim that approximately six percent of the product is made up of human urine. That’s where it gets its signature flavor from. It turned out the whole report is entirely fabricated – to no one’s surprise. It started as an innocuous joke on the satirical, Onion-like website Huzler that’s famous for releasing hilarious fake news content. Sometimes, unsuspecting visitors have no clue what’s going on, so they start spreading the stories as they are facts. Believe it or not – it happens quite often. There’s even a whole subreddit devoted to the phenomenon – r/atetheonion. In case you stumble upon a post from Huzlers, don’t take it seriously. If you’re up for some fun, you can use the story to pull a prank on some Arizona tea-loving family members or friends, but don’t be too cruel please and reveal the truth to them shortly after. There’s no trace of credibility in the claim that the company uses human urine to produce the tasty beverage. If the allegations were valid, all of the world’s mainstream news outlets wouldn’t stop going on and on about it for months about it. After all, how often does pee end up in tea? To set the record straight, the company has denied the allegations on social media. Over and over again. Considering that the report has potentially damaged the company’s sales and reputation, maybe it was done in bad taste. The matter is perhaps more severe than it seems. It bears some resemblance to a true story from the past. Well, the story about the story is right – you’ll see. Corona Extra was unstoppable at the beginning of the eighties. It was second only to Heineken, in terms of sales. All of a sudden, their sales plummeted – the American consumers had turned against it, and the stores had begun to refuse to sell it. The fabricated story was traced back to a local Heineken distributor, and Corona sued for damages. A settlement was reached, and the Nevada-based distributor of Heineken was forced to deny the allegations publicly. The damage was done, and the company’s reputation continued to suffer. So next time, maybe Huzlers should think twice before poking fun in such a manner.